... which revealed the perfect space on the designer paper for me to stamp my sentiment from Peaceful Petals. You can see that I wrapped some of the gorgeous twine from the free Sale-a-bration Accessories Pack around the panel. I 'nibbled' bits from the edge of the panel with the pointy bit of my Mosaic punch so that the twine would sit neatly and then mounted the panel onto the DSP using dimensionals. The circle was sponged on through a mask made with my 2 1/2" circle punch and the line art flower , also from Peaceful Petals, was stamped over the top in black stazon ink and left uncoloured for a retro look. This card was inspired by this week's fabulous Fusion challenge. The colours and the black line art on a coloured block background were taken from the inspiration photo, and I also used the amazing sketch. 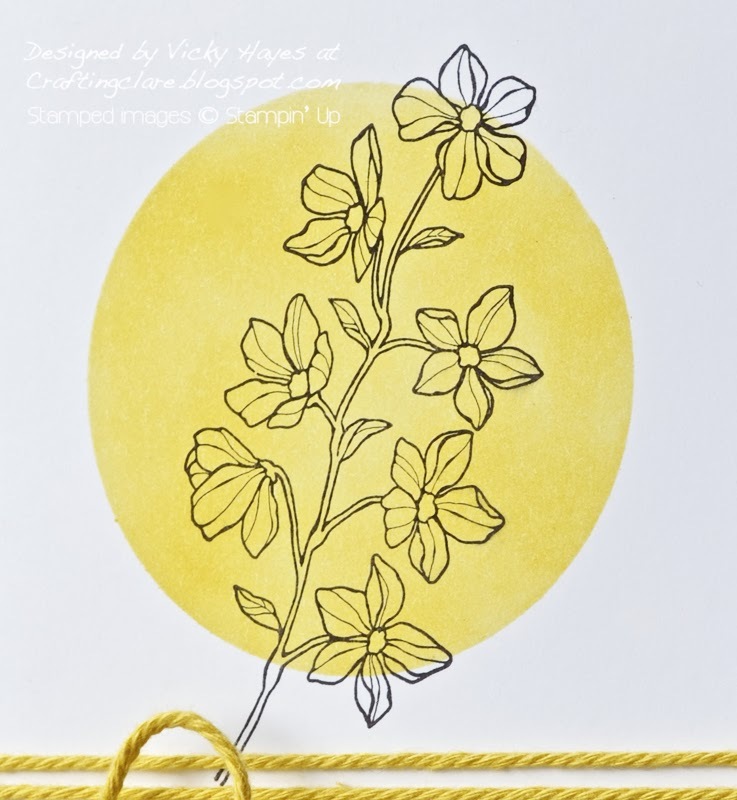 I shall also be linking this card up with the Paper Players where the lovely ladies are looking for spring thank you cards. Yesterday, my eldest son left school at lunchtime as he had an interview at our local college where he has applied to do a Graphic Design course after completing his GCSEs. I could tell he was a little nervous as he isn't taking art at GCSE which is the usual entry requirement; instead he had taken along a portfolio of his work all of which he has created on the computer, coming up with ideas and teaching himself techniques as he's gone along. When he came out of the interview he told me he thought the interview had gone well. Apparently he had shown each piece of artwork and talked about it and after that the interviewer said: "Okay - I'm telling you right now that you're definitely getting a place on my course!" I'm so excited for him and very, very proud. Of course it was far too late to return him to school, so I took him for a slap up meal instead! Beautiful! I love the curved edge! A really elegant card and congratulations to your Son for getting on the course. hugs Mrs A. Love the fresh look of your card and congrats to your son. He must take after his Mum! Gorgeous card - perfect from that sketch too. Congrats to your son for showing some initiative and to the interviewer for recognising it! Congratulations to your son for gaining a place at College - you must be extremely proud! Just love the curved edge on this card Vicky. And how brilliant of your son. Well done to him!! I love how you did the curve on your card. So clever and really draws the eye to the sentiment. How wonderful for your son. And to think, he has done that on his own and they recognize his talent. Great job! Tell him congratulations. Love love love your card, it's "clean", also love the paper you have used. GREAT news of your son, what a wonderful start for him, he must be very talented. Clean and lovely, Vicky! The chevron paper is so fresh. I love the curved edge and the sponged circle. Thanks for playing with The Paper Players this week! 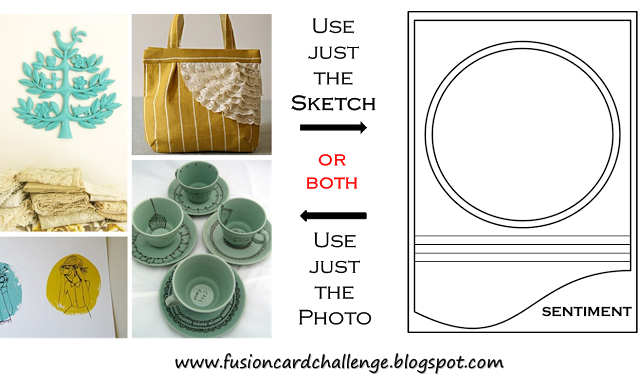 Vicky, it is always a pleasure to visit your blog and see what craftiness you are sharing. I can't say enough about this card...it is just stunning. Classy, elegant and a breath of fresh, spring air...simply lovely! So glad you joined us at The Paper Players! Oh, wow, I love this!!! Simple, soft, subtle...and so very lovely! Amazing how pretty the stamp looks over the yellow circle! Such nice design elements...thanks so much for sharing it with us at FUSION! Awesome card! Love the curved panel over the chevron panel. Love how you sponged the circle and the stamped flower image over it. 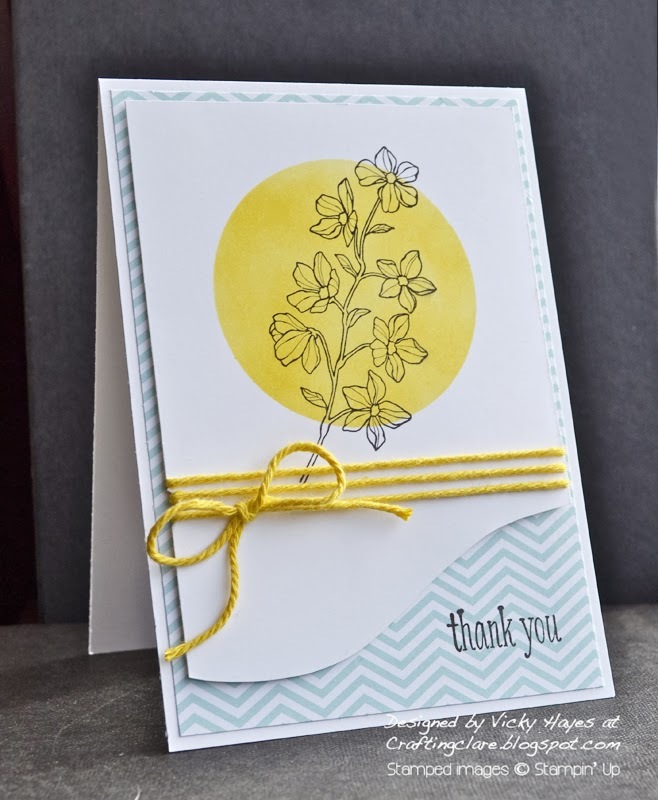 The yellow twine is the perfect embellishment for this lovely CAS card!! Congratulations to your son! Love the card! Super super beautiful card. Love the CAS design. Really great job. Thanks for playing along with us in the Fusion card challenge and hope to see you again. Your card is so soft and beautiful. I love the masking! Thanks so much for playing along with us at Fusion!